You won’t find this museum on any top 10 lists and perhaps that’s why I like it so much: for a city overrun with tourists most of the year it’s refreshing to know that sometimes, great art can remain a secret. In fact when you go to Palazzo Altemps, you will probably be alone. Lying just a few steps from Piazza Navona, Palazzo Altemps is a magnificent 15th century palace and one of four national museums in the city. 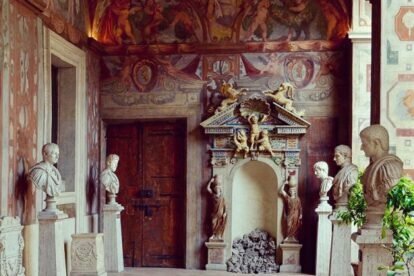 It houses important Greek and Roman antiquities, primarily statues, belonging to Rome’s noble families in the 16th and 17th centuries. These statues are carefully arranged within each room to replicate how they would have appeared hundreds of years ago – grandiose and giving each statue its due space, allowing you to truly contemplate upon the art without distractions. The palazzo itself is impressive and has an elegant courtyard as well as numerous porticos with frescoes on the ceilings. It is one of my favorite museums in the city precisely because the space is so beautiful, bright and airy – you don’t feel like you are in a museum but instead that you have been transported into some hidden realm of tranquility and aesthetic pleasure. Bonus: you can visit the other three national museums on your combined ticket (Palazzo Massimo, Crypta Balbi and the Terme di Diocleziano), a great deal for the wealth of heritage contained within each of them!